Dental ceramic materials available today make it possible to create elegant, high-quality ceramic restorations, even in prosthetically and esthetically challenging cases, and the current technologies utilised ensure predictable results. State-of-the-art ceramic materials is summarised using modern cosmetic dentistry. 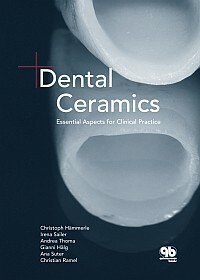 Starting with a brief introduction to the types, physical properties and characteristics of the current dental ceramic materials with the practicing dentist in mind, the authors proceed by outlining the clinical indications for these materials and by describing the specific procedures for placement of ceramic providing an invaluable reference for daily clinical practice. The authors address related subjects, such as the restoration of non-vital abutment teeth and esthetic enhancement methods, including the latest bleaching techniques. This fact-filled and well-structured compendium is also a valuable learning resource dor dental students.